Extreme cuts, layoffs, and furloughs are needed to fix the overexpanding budget hole. 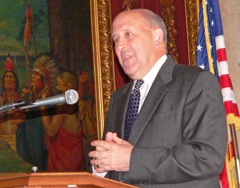 Declining revenues could add another 1.5 billion dollar gap to the current 5 billion dollar deficit and, as a result, Governor Jim Doyle says up to 11-hundred state employees could be laid off. Doyle also proposes 16 days of furloughs for all state workers over the next two years. "Under state contracts I can impose a maximum of eight days per year and this is the equivalent of a 3% pay cut." The governor wants to rollback the 2% pay increases for nonunion employees that were set to take effect in June. After deciding to furlough state workers, Doyle says he&apos;ll also make some sacrifices. "As you probably know the Constitution already freezes my pay, and I cannot be furloughed. However I will return eight days of pay each year to reflect exactly what we are asking all state employees to do." That amounts to a little over $4,000 each year. Doyle warns, we can expect longer lines, fewer services and higher tuition for college students. Next week we&apos;ll have a better look at the budget deficit as the Legislative Fiscal Bureau releases its analysis.